When most people think of Hawaii, they think about the great weather, pristine beaches and friendly locals. But there’s something that most people don’t think about until they move to Hawaii and are confronted with the problem. That problem is termites. These insects have been wreaking havoc in Hawaii for decades. Depending on what island you’re located on, there could be a few different types of termites in your area. Termites are distinguished between wet wood and dry wood termites. The most well known termite is the Formosan subterranean termite, a wet wood termite. The Formosan termite lives underground and prefers wet areas. This termite causes a great deal of damage and can completely destroy a home within 6 months if left untreated. Another common termite is the West Indian dry wood or the dry wood termite, which prefers dry areas and is only second to the Formosan termite in the damage it causes to Hawaii housing. 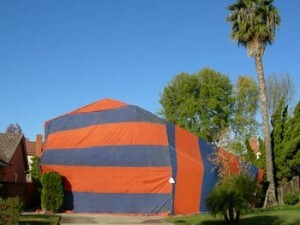 The best way to avoid termites is prevention. One of the easiest ways to prevent termites is to limit wood to earth contact on your home. The subterranean termites will burrow into wood that is touching soil very quickly. Any wood to ground contact provides an expressway to the rest of your home. Patch any nail holes or other damage to wood immediately upon discovery. Remove plants that are touching the outside of your house, especially in areas where the plants are touching wood surfaces. For rehab projects on older homes, try to buy wood products that have been pressure or chemically treated to prevent termites. These products usually cost a little bit more, but in Hawaii with the amount of termites, the cost is worth every penny. The effects usually last 7-10 years so be sure to retreat the wood to keep it from being infested. If you think your home is infested you should call a pest control professional and ask for a termite inspection. I called around to some local companies and for a 1,500 square foot home, the average price was between $350-$400. Termite Baits – Baits are placed around the home and will gradually kill off a colony by spreading small amounts of pesticides across the colony. Borate Treatment – This treatment is much like a coat of paint on wood. The best time to use this is during construction or rehab projects. Fumigation – Fumigation only works on dry wood termites and requires a tent (those red and orange circus-like tents you see around town). You will have to leave the home during this process and it is the most expensive. Microwave – This is used to heat the wood in the home to 120°F. The termites and larvae can’t survive and the infestation ceases immediately. My termite guy uses Mother Earth — works well and is safe for people & pets. All of these treatments should be done with the advice of a professional. Contact your local exterminators to determine the cost and time frames associated with the treatment you request. If you are buying a home in Hawaii or rehabbing a property, make sure to get a professional termite inspection. We hope this information presented here will help protect your current and future home! Thanks friend. This is cool reading. Thank you, tsanko. I’m glad you like the site! Plenty of great information yet to come! I admire your web page , it’s filled of lot of information. You just got a perennial visitor of this site! there is no actual “prevention” once the house is built except for clearing vegetation away from any wood and to get regualr inspections to catch activity early and possibly spot treat. our home is about 10 years old (or less) as is our neighborhood and there is no known termite activity in the “hood” and most of our wood is surrounded by concrete. please let me know if there is something i’ve missed in all of this as i would much rather act “preventatively”. Hi Judy! Glad to have you contribute here. To the best of my knowledge according to the most recent termite treatment techniques, there is no such thing as 100% prevention for wood-built homes. Your best bet is for preventative maintenance with the methods described above. Also, vegetation-to-wood contact isn’t as important as preventing earth/ground-to-wood contact – this will inhibit the subterranean termites from infesting your home.